(Nanowerk News) A smart liquid that darkens dramatically in response to rising temperature has been developed by researchers at A*STAR. The nanowire-based thermochromic liquid’s tunable color-changing behavior was retained even after hundreds of heat-cool cycles. This liquid could have applications ranging from smart windows to paper-based temperature sensors, the researchers say (Advanced Materials, "Thermochromism from ultrathin colloidal Sb2Se3 nanowires undergoing reversible growth and dissolution in an amine– thiol mixture"). Previous thermochromic liquids have usually been based on organic dyes or liquid crystals. Although amenable to industrial-scale production, organic dyes tend to degrade upon exposure to light, while liquid crystals require encapsulation to avoid degradation in air. 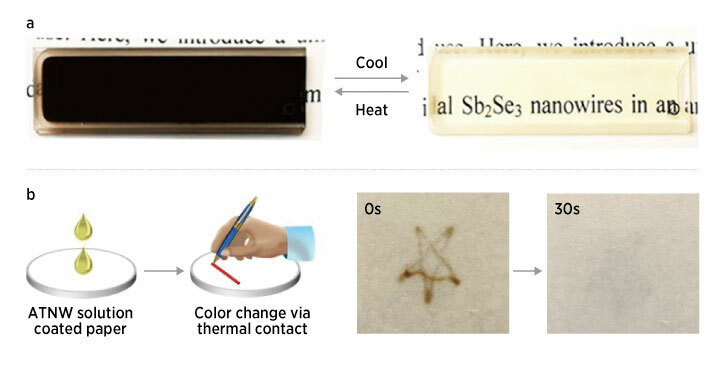 A thermochromic liquid that overcomes these limitations has been discovered by Wen-Ya Wu and her colleagues from the A*STAR Institute of Materials Research and Engineering, in collaboration with researchers at the National University of Singapore. The team showed that the thermochromic liquid’s color-changing behavior is long-lived and robust. A solution of the molecular precursors was stable even after two years in ambient conditions, and could be heated and cooled hundreds of times without any loss of performance. An additional advantage was that the color change transition temperature could be tuned to be anywhere between 35 and 140 degrees Celsius by simply adding a small amount of tin chloride to the mixture. The tin species interact with the selenium precursor, reducing the temperature for nanowire growth.